The double action hydraulic press may use four columns or the portal frame construction, which is simple, economical, and practical. The frame posture tension bar pre-tight structure is of high precision and good rigidity. The guidance precision is guaranteed due to the adoption of eight guide rails. The hydraulic control uses cartridge valve integrative system, the fat liquor secondary filter installation and the water cooling installation. This ensures reliable movement and reduces the leaking point. The imported material cylinder seal parts are used for long service life. The press is of PLC control. It can realize the constant pressure and decide the regulation, with high working speed and production efficiency. The double action hydraulic drawing press is also designed with a touch screen monitor for user's convenience. It is commonly used in automobile, aviation, astronautics and ship building industries. 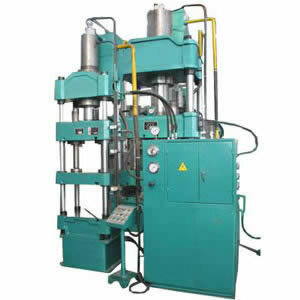 Rugao Yaou Company is a China double action hydraulic press manufacturer and supplier. Located in Rugao, Jiangsu, we have access to convenient transportation by sea, air and land. To meet different requirements of our customers, we provide a wide range of products, including drill rig parts, oil drilling tools, shearing machines, hydraulic press brakes, and more. Additionally, we also offer OEM service, onsite maintenance, debugging and training services, upon request. If you are interested in our oil drilling equipment or hydraulic presses, please feel free to contact us for more information! This hydraulic press is suitable for pressing process of plastic material, like stamping, bending, flanging, stretching and so on. It can also be used for adjusting, press mounting, as well as forming of plastic products and powder products.